11/19-20: Designer Con 2016 – More Space, More Fun! Entering its’ second decade, Designer Con returns with a BANG in 2016, adding 20,00 sq ft of space and an additional venue! Among this year’s event plans, DCon is working with Adventures in Design to MC special panels, presenting an art show exhibit with 1000 toys from Japan, and teaming up with Crewest Studios for a Saturday night party! Last year, Designer Con geared up its’ time machine for a slight diversion to the ’80s. This year, the event’s soft theme will be the 90s! And, that’s not all — Designer Con 2016 has, even more surprises to be announced, so stay tuned. Be sure to pen November 19-20 in your calendar! Designer Con began in 2005 and took place in a 1100 square foot room at the Pasadena Civic Center. Each year the show grew in attendance, vendors, attractions, and space to hold it all; from 1100 sq ft, to 3000 sq ft, to 10000 sq ft, to 25000 sq ft and this year, to a whopping 100,000 sq ft of art, toys, customs, apparel and more! The 2005 show featured 10 vendors. In 2016, Designer Con will host nearly 400 amazing companies and artists! This year the show is, for the first time, adding a venue. The Rose, which is across the street from the Pasadena Convention Center, will host panels with special guests, as well as the official Designer Con Saturday night party! Need more info, images, interview opportunities, media credentials? Contact me via the contact form on this website. Looking forward to seeing everyone out in beautiful Pasadena! At Designer Con 2015, Paul Kaiju will be sharing booth 533 with Splurrt. All figures at the booth will be available by random drawing, just like last year! Saturday and Sunday’s offerings will be on display throughout Designer Con, so come early to check out all the pieces and pick out your favorites. Follow Paulkaiju and SPLURRT on IG for sneak peeks! 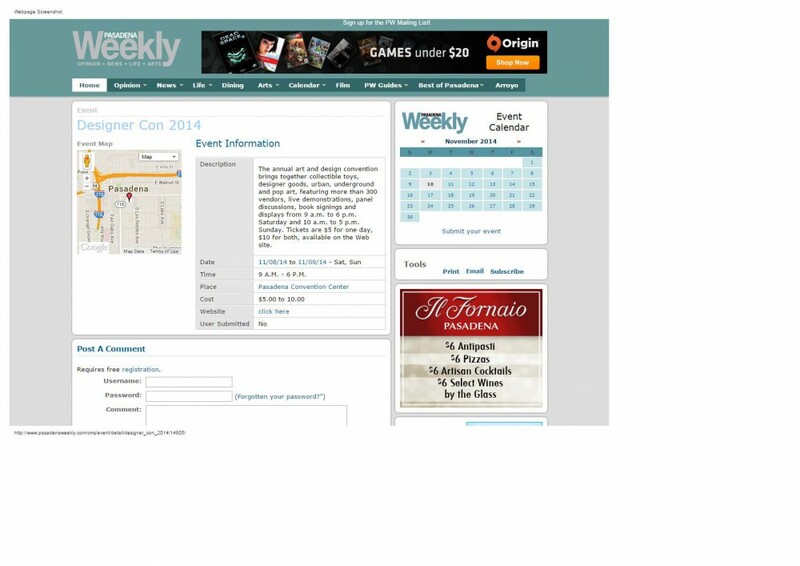 Designer Con 2015 happens This Weekend! Paid parking is available at the Pasadena Convention Center and several surrounding parking lots including Paseo Colorado directly across from the convention center. Click here for $5 online tickets. Ticket prices at the door are $7 per day. Designer Con is an annual art and design convention that smashes together collectible toys and designer goods with urban, underground and pop art! DCon is over 70,000 sq. ft. and features over 300 vendors, art & custom shows, live demonstrations, and much more! The show coordinators, Ayleen Gaspar & Ben Goretsky, strive to provide a fun, safe, comfortable environment for fans, artists, and vendors to meet. Join us every November at the Pasadena Convention Center for a weekend of fun, toys, and art! Click Event Links for Updated Info! For the first time ever, the private collection of Ben Goretsky’s Back to the Future art will be on display at Designer Con. Over 250 pieces of art all related to the timeless classic trilogy. Ties into Designer Con 2015’s theme of Back to the 80’s the Back to the Future art show will display a majority of the private collection. Art from around the world focused on the movie will be on display in place for fans to see. Art forms from all mediums will be on display. Canvas, print, sculptors, designer plush… all focused around the movie. Designer Con 2015 Annual Art & Design Con Nov 21-22 Pasadena! We are proud to announce that we have again partnered with the Hilton Pasadena as the official Designer Con 2015 hotel! More info on rooms will be available closer to the show, so please check back here! DESIGNER CON 2015 VENDOR LIST IS NOW UP! All your favorite artists and brands in one room! Over 300 vendors and artists! Having collected toys for as long as she can remember, Ayleen has a soft spot for Ewoks, horror movie figures, and Batman. A lifelong Lego maniac and plush aficionado, Ayleen’s toy addiction started as early as she can remember with classic 80s toy lines like He-Man, The Real Ghostbusters, G.I. Joe, TMNT, Cabbage Patch Kids, and My Little Pony. From there her obsession grew to include Monster In My Pocket, McFarlane action figures, and a plethora of designer vinyl. When not coordinating Designer Con, Ayleen spends her time making toys as co-owner of October Toys, producing/hosting Toy Break, and visiting Disneyland frequently. Ben is a toy producer and art aficionado. He owns and operates 3DRetro, coordinates the annual toy/art convention Designer Con, and publishes the L.A. lifestyle magazine Divulge. When not making toys or buying art, you can find him watching Back To The Future and noshing at his favorite food trucks. Check out the setup of the biggest Designer Con yet! Designer Con is an annual art and design convention that smashes together collectible toys anddesigner goods with urban, underground and pop art! DCon is over 70,000 sq. ft. and features over 300 vendors, art & custom shows, live demonstrations, and much more! The show coordinators, Ayleen Gaspar & Ben Goretsky, strive to provide a fun, safe, comfortable environment for fans, artists, and vendors to meet. Join us in November at the Pasadena Convention Center for a weekend of fun, toys, and art! 4 pm – 5 pm Custom Resin Figures: Art or Theft?